Including CQ Plus digital supplement! 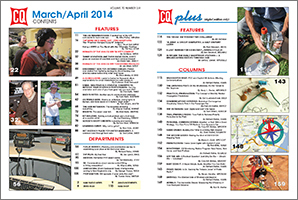 The March/April issue of CQ is a one-time combined issue that is part of our ongoing efforts to get our print edition back on its regular publication schedule. We apologize to our readers for the delays of the past several months and hope that this schedule adjustment, as well as last month's introduction of our CQ Plusdigital supplement, will help get us permanently back on track. As of mid-March, the January print issue was in the mail, with February following close behind. The March/April issue should mail in mid April. Digital editions are all available online. We appreciate your patience. 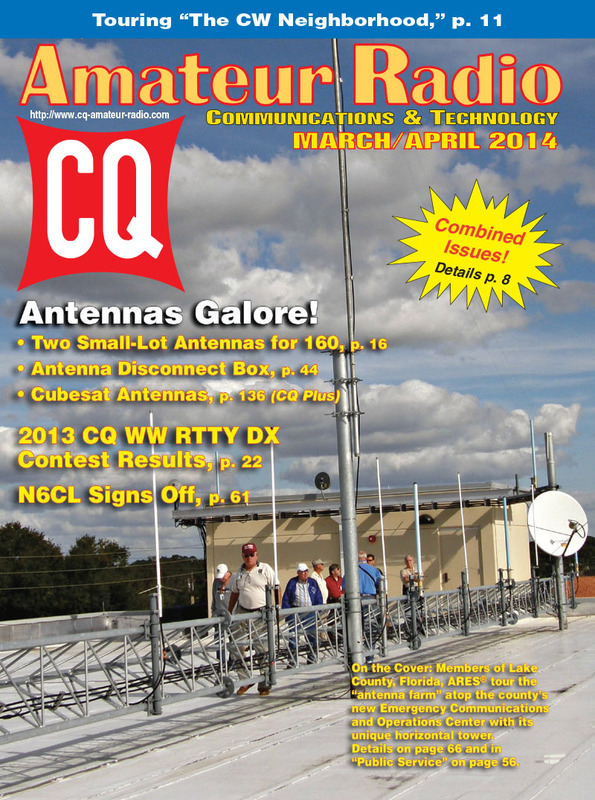 In this issue, we've got a mini-Antenna Special, with three antenna-related articles in our main section, plus two more in CQ Plus. In the main section of CQ - which will be published in both the print and digital editions - we start out with a "tour" of "The CW Neighborhood," by Mike Pulley, WB4ZKA, a helpful guide for newcomers to the code bands to who does what where. Next, we offer two different solutions for a common problem - trying to put up an antenna for 160 meters on a small lot. Scott Hall, N0UV, presents the "Practical Compact Lazy 'U'," while Tom Hart, AD1B, explains how he's solved the Top Band problem with a G5RV and his "160-Meter Toolbox." Also on the antenna theme, Dave Malley, K1NYK, shows us how to build a disconnect box for antenna cables to minimize risk from lightning strikes. We've got the results of the 2013 CQ World Wide RTTY DX Contest in this issue, with a record number of logs submitted and 13 new world records set. Big winners include LB8IB (Single-Op, High Power), FG5LA (Single-Op, Low Power), YW2LV (Single-Op, QRP), RG9A (Single-Op Assisted/High), N2QT (Single-Op Assisted/Low), OK3C (Single-Op Assisted/QRP), ID4Z (Multi-Single/High), VP9I (Multi-Single/Low), CR3A (Multi-Two), and ES9C (Multi-Multi). Next, we take a step out of the shack and into the classroom with "Three Scientists and their Radio Days," by Hiroki Kato, AH6CY, about the importance of radio as a career building block for three well-known scientists and professors. We also have the results of last year's CQ World Wide Foxhunting Weekend, as moderator Joe Moell, K0OV, reviews the different approaches taken by groups around the world to finding hidden transmitters. Professor Emil Heisseluft makes his annual April visit, reporting on explanations for on-air misbehavior by hams from an expert at the Lauton Institute's Center for Research of Abnormal Personalities. And from the cutting edge of modern science, Don Keith, N4KC, takes us back in time with a look at "Using 3000-Year-Old Oriental Concepts to Improve Your Station's Performance." Finally among our features, Ted Cohen, N4XX, explores the unique relationships that ham radio can form in his Easter/Passover-themed "Set Another Place for Sister Margaret." Moving on to this issue's columns, "Math's Notes" editor Irwin Math, WA2NDM, describes "Another Way to Communicate Wirelessly" (following up on his introduction to the concept last April); Public Service Editor Richard Fisher, KI6SN, explains how "Planning and Coordination are Key in Establishing Your Place at the EmComm Table," and International Editor Tom Smerk, AA6TS, reports on "Storms vs. Antennas, Young Hams in Europe, and More Space on 6 Meters 'Down Under'." Ham Notebook editor Wayne Yoshida, KH6WZ, looks into "The Incredible Shrinking … Everything;" CQ Editor Rich Moseson, W2VU, subs for a too-busy-at-work Makers Editor Matt Stultz, KB3TAN, with a report on scratching a "Seven-Year Itch" on his workbench; and Kit-Building Editor Joe Eisenberg, K0NEB, writes about a project he built to solve a problem at work (and that you might also find useful), as well as a look back at a very popular kit from the '80s. Gordon West, WB6NOA, discusses "Listening and Learning" in his review of several new products in "Gordo's Short Circuits;" "Learning Curve" editor Ron Ochu, KO0Z, goes grid-hunting, and VHF-Plus Editor Joe Lynch, N6CL, signs off with his "final final," as he steps down to devote his full energies to his new position at West Point. Awards Editor Ted Melinosky, K1BV, looks at Romania's FRR award series; DX Editor Wayne Mills, N7NG, begins a discussion of remote-control DXing by posing the question, "Is DXing Competitive?" Contesting Editor George Tranos, N2GA, previews this summer's World Radiosport Team Championship event in New England, and Propagation Editor Tomas Hood, NW7US, ponders the question of whether this year's Sporadic-E season might get an early start. The print edition of CQ ends here, but the digital edition continues - with our second issue of CQ Plus, a 50-plus page supplement incorporating content from Popular Communications, CQ VHF and WorldRadio Online. We start (as we will every month) with "Washington Beat," our monthly look at FCC and Capitol Hill actions affecting communications, followed by "The 100-Milliwatt AM Transmitter Challenge," by Bill DeFelice; CQ Editor Rich Moseson, W2VU's look at the "HI JUNO" project and how it closed the loop on a QSO from space begun a half-century ago; Ken Neubeck, WB2AMU, reports on "A Last Hurrah for Six-Meter F2 During Cycle 24," and Gerry Dexter, WPC9GLD, looks back at "The Early Shortwave Stations: A Broadcasting History Through 1945." "Practical Propagation" editor Carl Luetzelschwab, K9LA (who just won the Bill Orr Technical Writing Award, by the way), discusses "the concept of monthly median propagation predictions;" Rob de Santos, K9RKD, looks at the growing role of video in passenger cars in his "Communications Horizons" column; Antennas Editor Kent Britain, WA5VJB, talks about "Goin' Digital and Goin' Into Space;" and CQ Plus Editor Richard Fisher, KI6SN, puts on his "Trail-Friendly Radio" hat to show us how put protect our gear from reversed-polarity power problems in the field. "Personal Communications" editor Cory GB Sickles, WA3UVV, discusses ways to persuade your spouse to let you install a CB rig in her/his car; Ryan Archer, KPC6KPH, entertains us with his story of "Building the FMer in a Dining Hall Disaster;" Medium Waves Editor Bruce Conti, WPC1CAT, helps you make the most of AM broadcast band DX mapping tools; FM/Repeaters Editor Bob Witte, K0NR, dives into Yaesu's new System Fusion digital gear, and our Monitoring column introduces our transition from KPC and WPC identifiers to KCQ and WCQ prefixes. "Off the Air" editor Cory GB Sickles, WA3UVV, wonders about why we volunteer, and asks if we even should! KI6SN introduces a new project column called "Easy Does It," and this month shows you how you can Do It Yourself (Easily) to build "A Super-Simple Audio Amplifier." Pirate Radio Editor Steven Handler, WPC9JXK, wonders if Dr. Benway could be the "Indiana Jones" of pirate radio (look for pirate station loggings at <http://cqpluspirates.blogspot.com>); and we wrap things up with "Unwired," our monthly look at "the Weirder Side of Wireless and Beyond," and the return of "Aerials" by the inimitable Kurt N. Sterba, pontificating this month on "The Impossible Dream: Measuring the Efficiency of your Backyard Antenna." 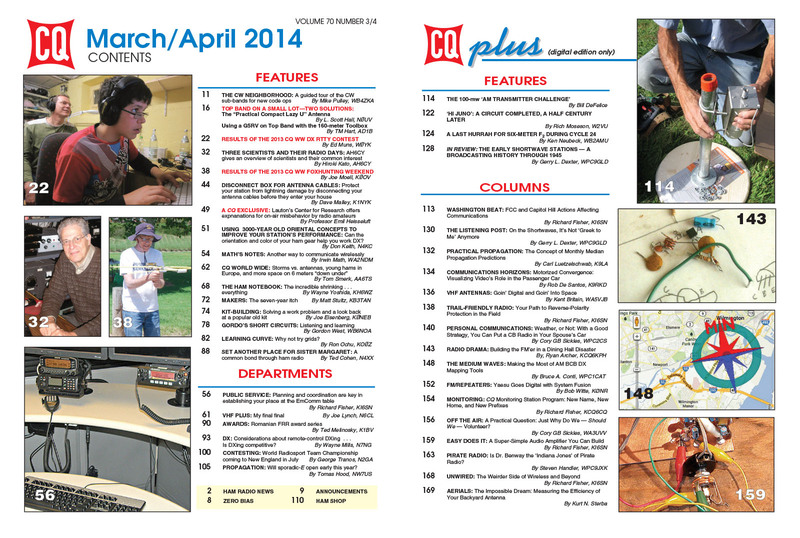 That's a brief look at what's coming up in the March/April issue of CQ magazine - now including CQ Plus. For information on becoming a CQ subscriber - print or digital - Click Here to Subscribe.